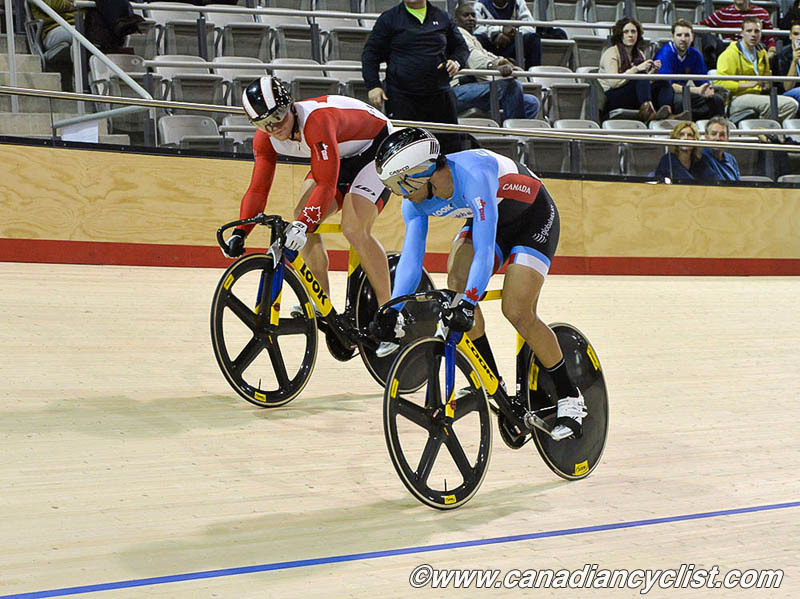 The second day of the Milton International Challenge saw the Sprint titles awarded and the first three events of the Omnium contested. 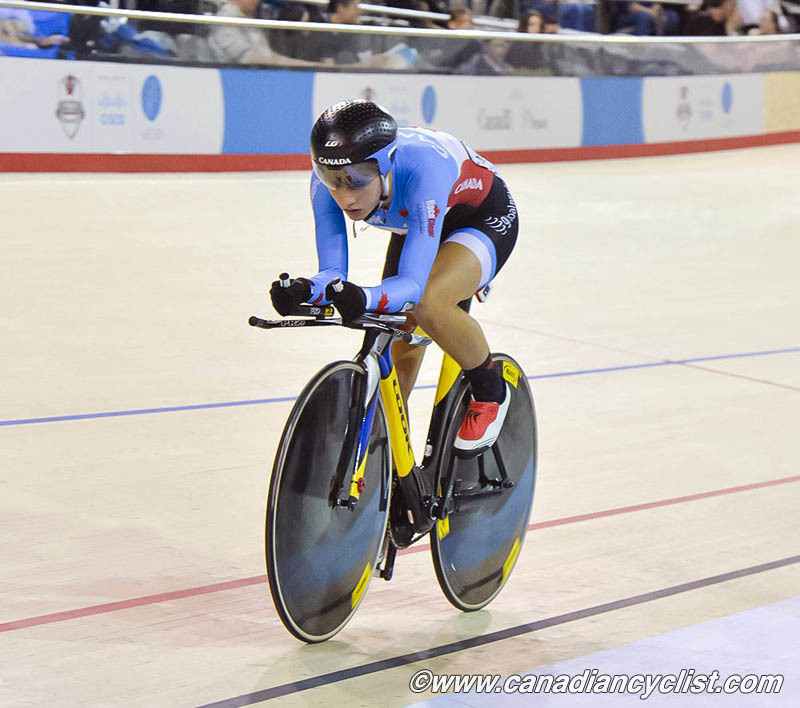 Canada's Jasmin Glaesser leads the women's Omnium after the first day, with victories in all three races: the Scratch race, Individual Pursuit and the Elimination race. With 120 points, she has a lead of eight points over national team team mate Stephanie Roorda and 12 points over Canadian Champion Allison Beveridge. 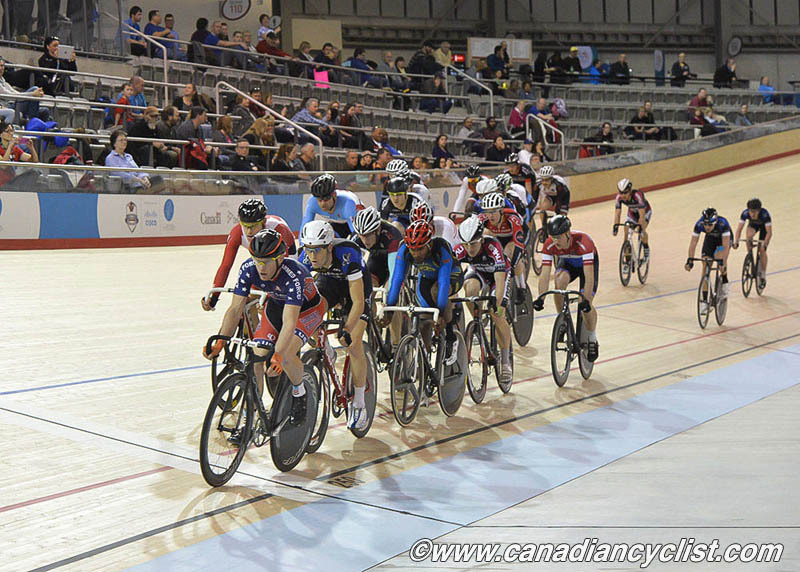 "[The perfect omnium] would be nice, but would certainly be a tough go," stated Glaesser. "Alli [Allison Beveridge] is very quick, and same with Steph [Roorda]. They both are in great form right now, and we have some strong international riders here. The 500m and the Flying Lap are definitely not my strongest events. I am really looking forward to the Points race. I was so disappointed last week, having to withdraw [due to illness]. It was a National Championship. I wasn't at my best and had to pull out of racing. Since that day, I have been looking to bounce back and making amends in this race." 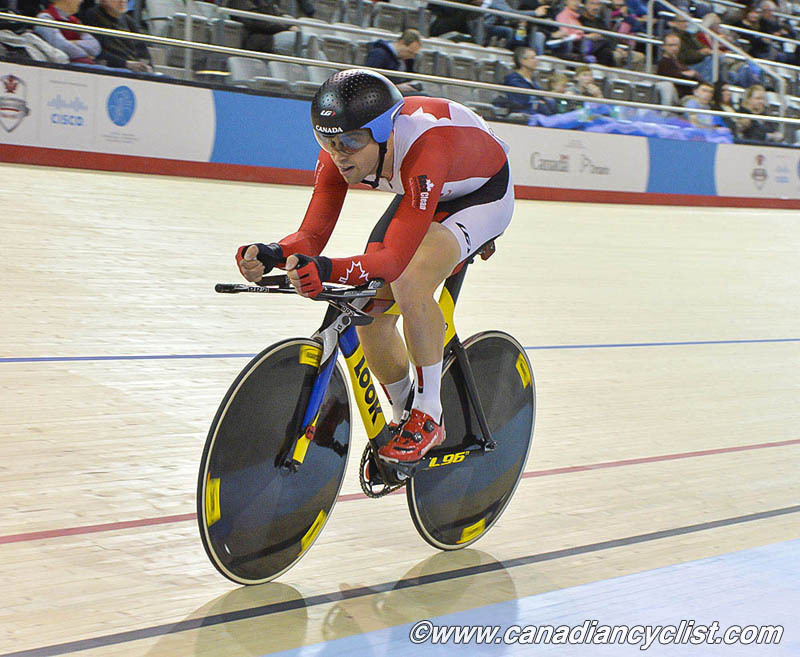 Rémi Pelletier-Roy, the Canadian Champion in the Omnium, raced to second place of the Scratch race, posted the fastest time of the Individual Pursuit, and took second place of the Elimination race after being relegated in the last lap when he dropped into the sprinter lane on top of American Zachary Kovalcik. Pelletier-Roy leads the men's Omnium by six points over his closest competitors, team mate Ed Veal of Team Canada and Kovalcik of Team USA, tied in second place. "The first day is always a little bit more dangerous," commented Pelletier-Roy. "Anything can happen in the Scratch and the Elimination races. I was pretty happy to finish second in both these races. In the Pursuit, I don't think I needed to go that fast, but I didn't want to take a risk and I wanted to use that as a training ride. It was a really good day. The Kilo and the Flying Lap aren't my strongest events, but I can manage to do well, so I can stay on top of the standings. The Points race is the race I have been excited about, and that's where the Omnium will unfold." 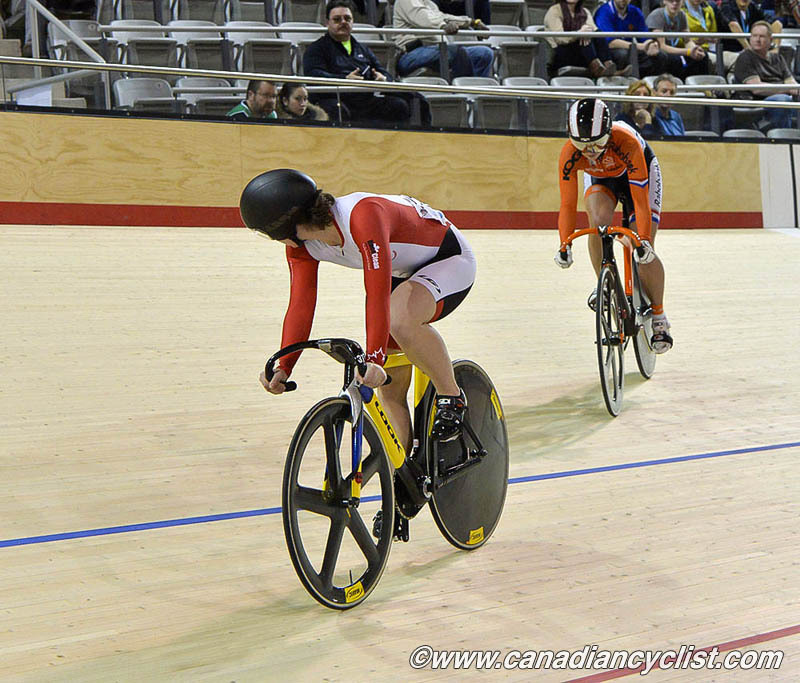 In the individual sprint races, Canada's national women's champion, Monique Sullivan, took the title with solid and dominant racing throughout the entire day. Sullivan faced Netherland's Yesna Rijkhoff in the gold medal duel, and defeated her opponent in two rounds to win her second victory at the International Challenge. 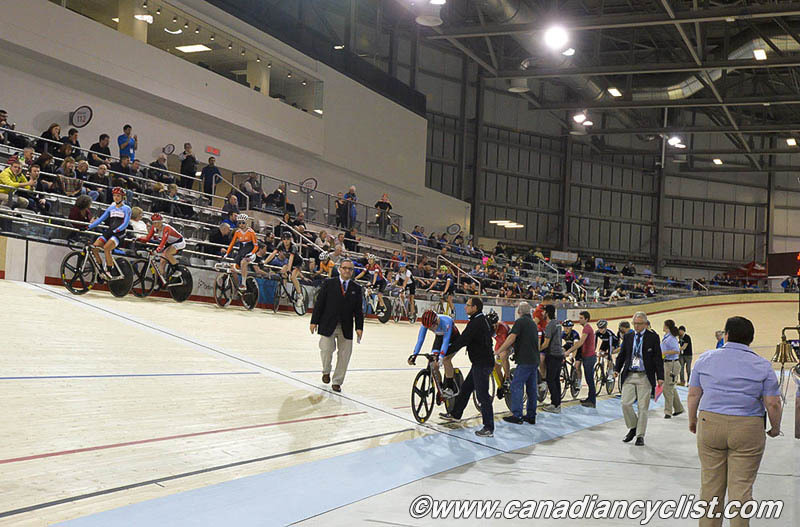 Canada's men's national sprint champion, Hugo Barrette, took control of preliminary heats. In the semi-finals he faced training partner Nijsane Philip of Trinidad who came fourth in the same event at the 2012 Olympic Games. Labeled as the "Clash of the Titans", Barrrette did not disappoint in front the Canadian crowd. He took the opening ride in a nail-biting fashion, and repeated his feat in the second round, coming from behind. Canada's Olympic sprinter Joseph Veloce qualified with the fastest time, and also dominated all the way to the gold medal dual, setting up an All-Canadian final and a repeat of the exciting sprint finals from last week's Canadian Championships. In the gold medal showdown, Veloce took the first of two heats, but made a critical mistake in the second ride, and Barrette jumped at the opportunity to win, and force a decider. In the ultimate face-off for the gold medal, Barrette quickly accelerated to take the lead position, and never looked back, taking the gold medal. Germany's Christoph Schweizer won the Points race by a single point over Nicholas Roger of the United States, and four points over his brother Michael Schweizer. The women's Points race was won by American Colleen Hayduk with 24 points, while her teammate Kate Wilson finished second. In third place was Great Britain's Amy Hill. 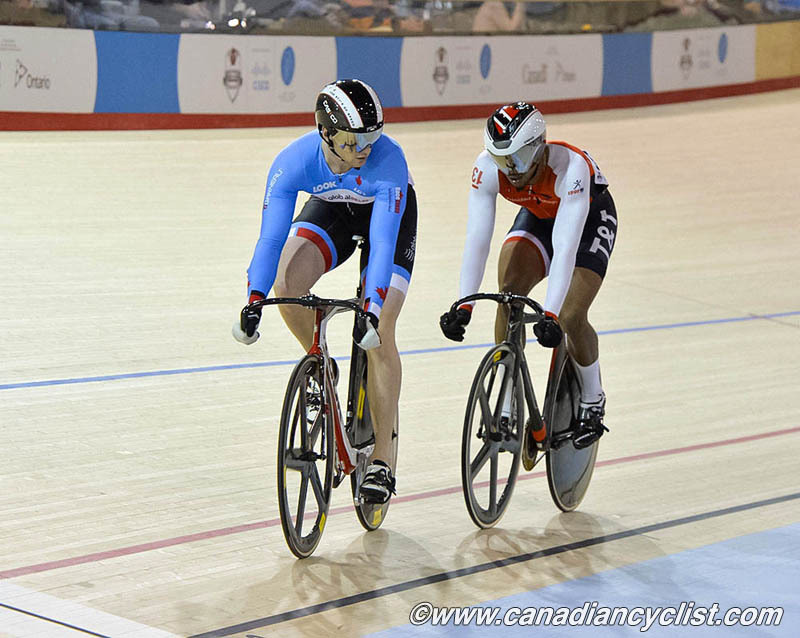 In Junior action, Sei Daniel of Trinidad took the men's sprint gold medal, and Charlotte Creswicke of Ontario finished first in the women's race.